All is not always safe in Alexandria, VA. Small, eight-legged creatures are invading homes across the area, frightening people where they eat, sleep, and play. Connor's Pest Control has the scoop on the most common species to look out for and how our professionals can prevent an infestation. 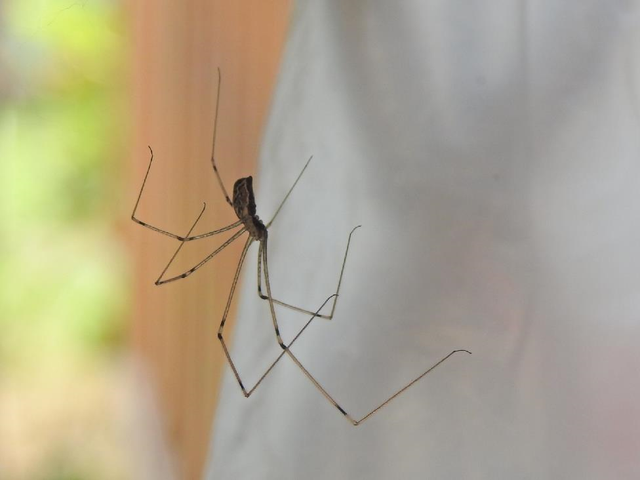 This species has long legs and hangs upside down from the ceiling in bathrooms, attics, cellars, and other rooms. It's a fragile spider that doesn't pose much of a risk to people or pets. However, it breeds continuously and will turn into a massive infestation within a few months. Fittingly, the brown recluse spider is brown in color and has a dark, violin-shaped mark on its head leading down its back. It's a venomous spider that produces a painful bite, leading to a necrotic ulcer that can spread if not treated right away. Although it tends to stay hidden outdoors under rocks, it will venture indoors and hide in shoes and other concealed spaces. Wolf spiders can grow to be over an inch in length and are a dark color with hairs covering the body. It's a predatory spider and hunts at night – though it will sometimes come out during the day. It rarely bites humans unless it's mishandled and can be found in cracks around baseboards, closet doors, and attics. The yellow sac spider measures about a half-inch in length, has a pale-yellow coloring, and prefers to stay outdoors in gardens and landscaped areas. It isn't dangerous, but it does produce a painful bite if provoked. When it comes indoors, this spider stays hidden in cracks and crevices. The black widow is venomous and should be left to your local spider control professionals when you see one. It has a characteristic red hourglass shape on its underside and tends to stay hidden under rocks and in wood piles. This spider will usually come indoors to seek shelter from the cold or to chase prey that has slipped into a crack. If spider infestations have you cornered in your own home, Connor's Pest Control can get rid of them for good. Whether it's a single cellar spider in the bathroom or several brown recluses around the patio, our professionals can identify the species and take curative action. We'll not only eliminate the spiders but also create a routine program to keep them from re-infesting your home down the road.